Every year, we get bottles of XO brandy and I really do not know what to do with them. We are not regular drinkers so I use the brandy for cooking and baking instead. Of course, sometimes, when I am feeling bored, I added brandy to ginger ale, Sprite or even wine to make it taste not so bad. During my post-natal period, I used a lot of brandy to steam chicken. It is a trick my sister-in-law taught me and oh boy, within a few days, I have rosy cheeks, very unlike post-natal moms. Of course,all the alcohol have evaporated in the steaming process and therefore, my baby who was breastfed did not get stoned. LOL. The above is a brandy roasted chicken. All I did was to put the chicken which has been cleaned into a glass bowl. Pour a few glugs of brandy, rub salt and mustard on the chicken and keep them in the fridge overnight. Just before roasting, I use the juice of one lemon to flavour the chicken. Don’t season lemon juice or the meat will turned flaky. Then, I stuffed the lemon rind into the chicken and throw in some fresh rosemary. After we carved out the meat, I used the chicken bones to make a delicous soup. Just add potatoes and carrots to the soup and boil for a while. 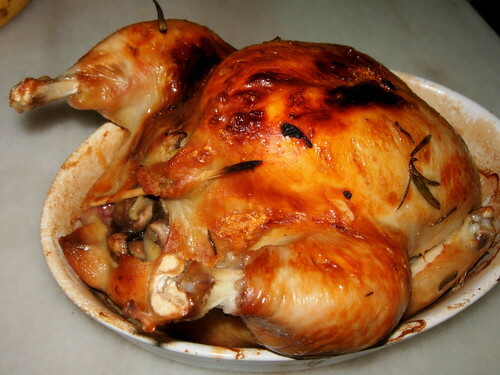 To find out how to roast chicken, please refer to my other food blog for the steps. aiyer…i want to make cheese kaya toast also have to tumpang my friend’s mini oven. 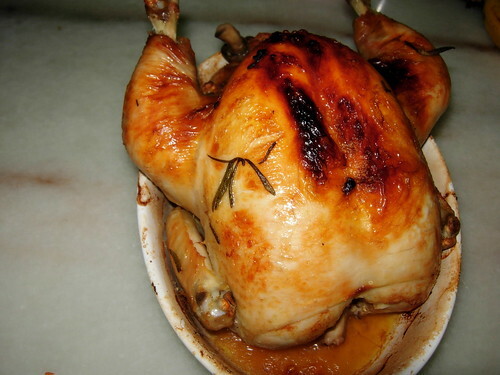 Ini pula selalu roast chicken roast lamb…So unfair la…Mom banned everyone in house from using the conventional oven. Seems another appliance become white elephant. Nice blogs(I’ve been visiting your other blogs)I love using lemon or lime juice when I’m doing meat or chicken. I mainly use it for clean/washing the chicken so as to remove that raw smell and taste that is noticed after cooking. Try washing without the lime/lemon and you will see what I mean. Anyway, if you get the chance stop by my food blog. Also I have a deal blog about anything kitchen. Thanks for posting this interesting recipe!